We all know that some conversations are more difficult than others. Ask anyone who has an aging parent or a sick loved one and most would say that end-of-life discussions are the ones they dread most. This is often a subject that is delayed for as long as possible or, in some situations, neglected altogether. It is one of the most critical conversations, if not THE most critical, that we will all someday face. It’s never too early to start planning for our own journey’s end, but National Healthcare Decisions Week (April 16-22) is an especially opportune time. This week, we are reminded to evaluate what is important and talk about our end-of-life wishes with loved ones while we still can. Having this information takes the burden off your loved ones and chosen health care agent by enabling them to follow-through with your wishes. The Five Wishes living will eliminates the guesswork that inevitably causes additional stress to an already challenging situation. Health Care Decisions week reminds us to make our wishes known. It also reminds us that for those dealing with a devastating diagnosis such as cancer, mesothelioma or other terminal illness, that the time to communicate end-of-life wishes is now. 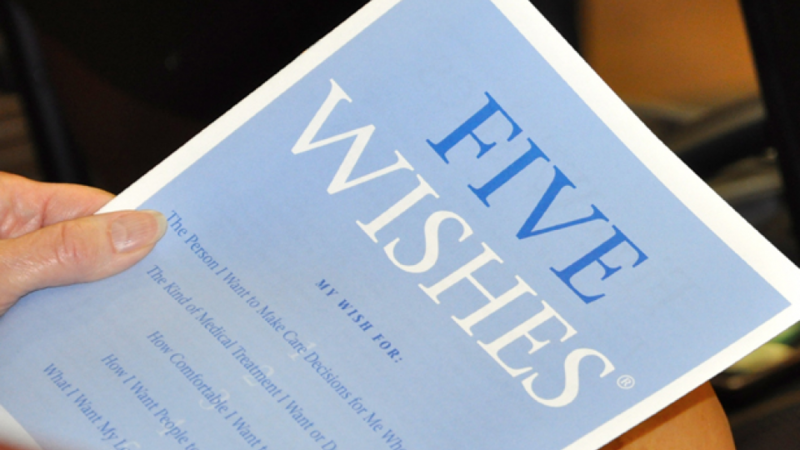 Don’t hesitate to contact 1-800-LAW-FIRM today and request your copy of the Five Wishes Living Will—it’s free, but the information provided to your loved ones will be invaluable.